How do I know that my cavities are healing ? If you take desiccated liver supplement, do you do that everyday or twice a week? Is this desiccated liver supplement okay to take instead of eating liver? Also how do you know how severe are your cavities? Are hard boiled eggs acceptable? How can the beef or chicken be cooked? I’m only used to well done. What’s a good mouthwash to use that can be purchased from the store? Your book has turned our vegan family on our heads (pets too)! Do you roast the marrow before or after making beef bone broth? 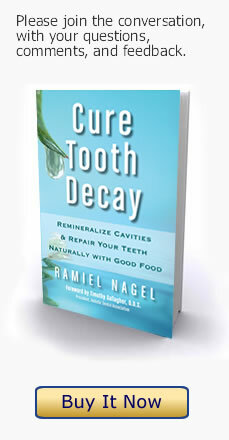 Can you cure cavities with whole food supplements? Are you supposed to purchase the cod liver oil and butter oil from Greenpasture.com or codliveroilshop.com? Which flavors or plain is best? How do you cook bone marrow separate from broth? Newsletter Sign Up - Get Informed!